Management Student, Retail Professional, Entrepreneur, Leather Connoisseur, Brand Artist, Design Enthusiast, Careless son, Carefree husband and Careful friend. 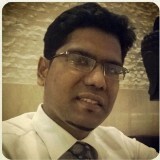 I introduce myself as Bala, a fellow entrepreneur in the laundry sector. I had co-founded and now run Wassup, a six-year-old startup in this space. How it all started and culminated into our launch at the twin city.